Rolling the 2002 into the sunlight for some headliner work. 3M's Super 77 adhesive is easy to apply and grips well. 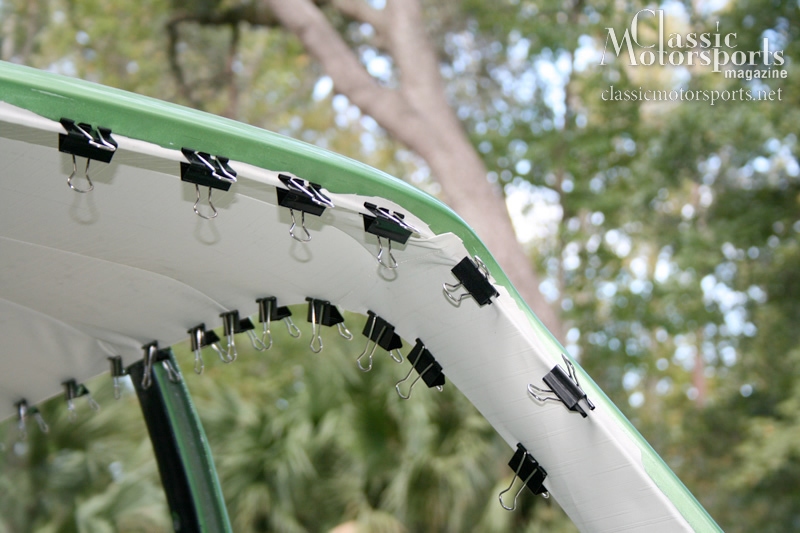 Binder clips are an easy way to keep the material in place while it is stretched and glued into position. Nearing completion. We just need to work out a few more wrinkles. 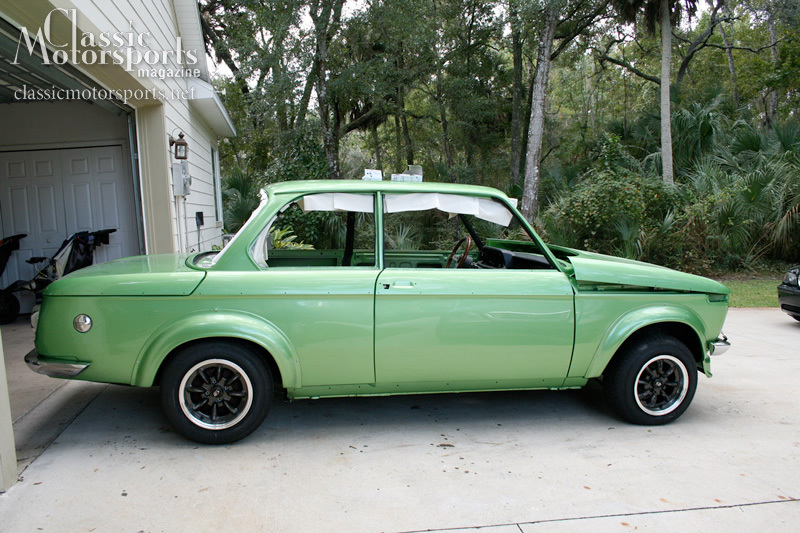 This weekend, we tackled a pretty big project in our 2002 restoration. The original headliner was torn and stained, and it really didn’t like being removed for the painting process. Our only real solution was to order a new BMW Classic Parts headliner from Bavarian Autosport. 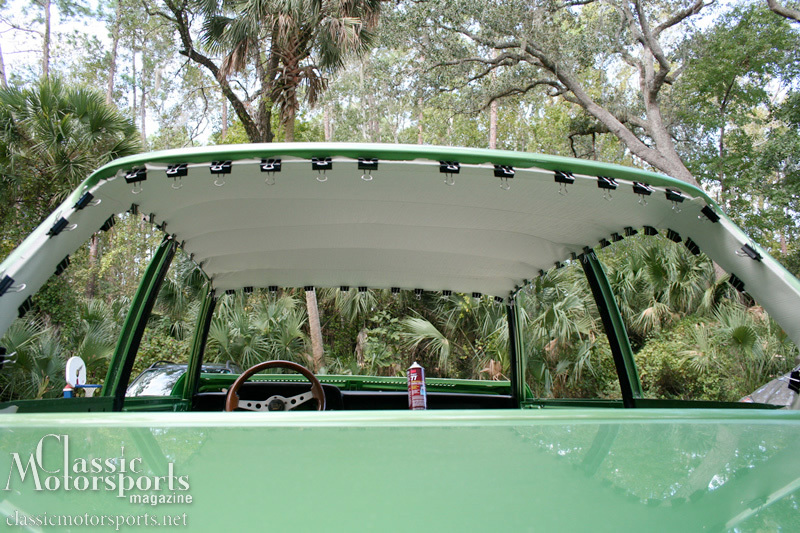 We started off by stringing the headliner up by its steel bows and stretching it into shape, starting with the rearmost portions first. We used medium-sized binder clips to keep the fabric in place as we wrangled it back and forth. Once we were satisfied with its positioning, we trimmed the excess material and started the gluing process. We used 3M’s Super 77 adhesive to attach the headliner to the edges of the roof, and kept the binder clips on while the glue dried. We also replaced the broken factory door brakes—which keep the doors from opening too wide—with re-engineered pieces from Harry Davis. These are priced at $105 for the set of two and are much stronger than the original aluminum and steel pieces. Very nice !! makes me want to tackle my MGA Coupe' headliner . Car is looking very Nice ! great idea using the clips .